Designing this product was quite unlike the other EasyGenie packages I’ve released in the past. The obvious difference is it’s intended for kids, not adults. 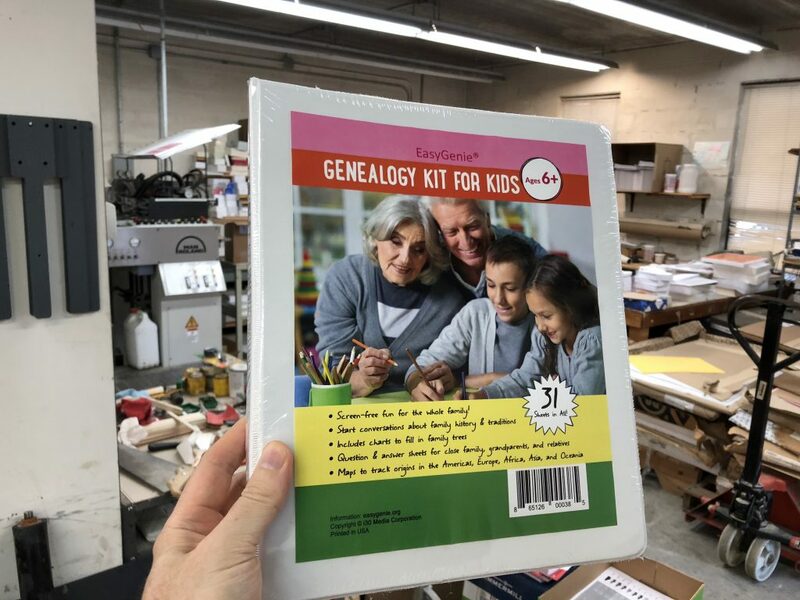 Earlier this year, I conducted a brief survey of the genealogy for kids marketplace and was surprised to see how limited the products were, not only in terms of the range of products available, but the quality of the materials. In many respects, they were scaled-down versions of genealogy paper forms for adults, printed on cheap copier paper. Recognition that kids have diverse backgrounds, including blended families and ancestry in multiple continents. This last point is driven home by recent government data on the nearly 74 million kids in the United States (“In 2016, 51 percent of U.S. children were White, non-Hispanic; 25 percent were Hispanic; 14 percent were Black, non-Hispanic; 5 percent were Asian, non-Hispanic; and 5 percent were non-Hispanic, All other races.”) So, the kids genealogy kit includes maps showing nearly every country and territory in the world, and encourages kids to decorate or annotate the maps with locations where their ancestors came from. One other big difference is the packaging. Kids are not the neatest and most organized people in the world (I say this as a parent), so this kit comes in a sturdy three-ring binder which not only makes it easier to store the contents, but also helps to preserve what’s inside. I want this new EasyGenie product to succeed, but I also hope that it sparks interest in a rewarding hobby and helps children and their families preserve information for future generations. 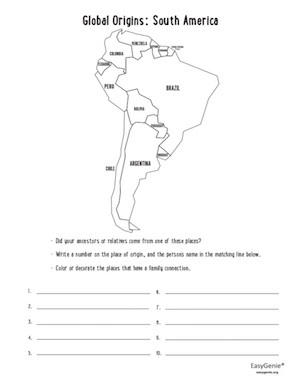 Learn more about the kids’ genealogy kit. “Tracking includes everything from creating good source citations to outputting data to a chart or tree. Along with preserving research (which we will cover in Chapter 5), it’s one of my least favorite tasks. After the initial excitement of making easy discoveries, it’s so frustrating to deal with tracking and filing and storing all of the information and papers you have found. Part of the reason I was not expecting to see such a deep examination of tracking research using genealogy forms relates to the fact that I use genealogy software to track my own research. The software lets me generate family group sheets, pedigree charts, and other pre-filled forms from my computer. Not everyone uses family tree software for research, though. They prefer paper, and use blank genealogy forms to enter names, dates, and other information. In addition, as Shannon noted in the book, computers have drawbacks, including the risk of a crash or some other disaster that wipes out the data. Paper genealogy forms provide some reassurance on this front. They also do not require a power outlet! 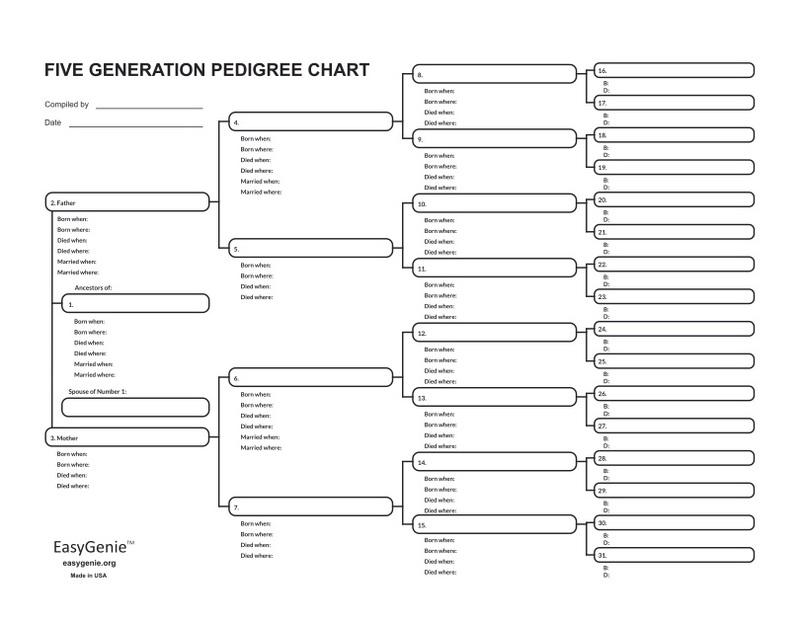 The pedigree chart contains fields for recording birth, death, and marriage information, and goes back to great-great-grandparents (all 16 of them!). Names are numbered for easy cross-referencing. UPDATE July 2018: Since this post was written in October 2016, my company has created other genealogy forms, including a kit that brings genealogy for kids!